The Canadian Journal for Educational Administration and Policy (CJEAP) was founded in 1995 at the University of Manitoba and merged with the Journal of Educational Administration and Foundations (founded in 1986) in 2016. The CJEAP is devoted to scholarly and critical works in the field of educational administration. The journal is currently hosted in the Department of Educational Administration at the University of Saskatchewan. It is the official journal of the Canadian Association for the Study of Educational Administration (CASEA). Drs Paul Newton and Dawn Wallin are the English-language co-editors. 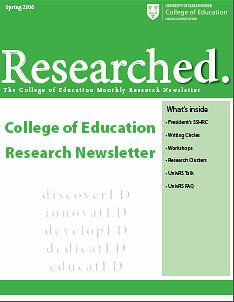 Education Matters: The Journal of Teaching and Learning was an open-access peer-reviewed publication forum for research in education for and by scholars throughout the world including new scholars from the University of Saskatchewan. As such, its primary objective was to foster connections among researchers to build a coherent knowledge base in education across geographic and intellectual borders while at the same time conveying a sense of local place related to the Canadian and Saskatchewan context. Contributions from graduate students were particularly encouraged.